What Is an Angle Grinder in Welding, and How Is It Used? As you’ll likely learn in your welding classes, fusing metals is just one small part of the job of the welder. Preparing metals prior to applying heat to them and then cleaning them up afterwards are also important steps to ensuring quality work that keeps employers and customer happy. When it comes to prep and finishing practices, an angle grinder can be a welder’s best friend. How Does an Angle Grinder Work? Angle grinders are welding tools commonly found in metal fabrication and other types of metalworking shops. They are handheld power tools with consumable stone discs or blades attached them. These discs or blades spin at high speeds to grind, polish or cut metals. Several disc sizes and amperages are available. Larger discs and higher amperage are typically good for industrial projects like beveling thick-walled pipe. What Is an Angle Grinder Used For? The angle grinder is an essential piece of welding equipment because of their diverse range of application. Let’s dive into a few of the most popular ways that welders use this tool for miraculous results. It’s easy – just fill out the form below and we will reach out with more info! With the appropriate cutting disc, you can use an angle grinder to cut thin metals. Metal cutoff wheels, however, can be used to cut rusted bolts, iron fencing or rebar because they employ an aluminum oxide as an abrasive. Cleaning base metals prior to welding them helps to prevent defects like porosity and cracking, especially for MIG and TIG welding because they don’t work well with slag. While a wire brush can clean off paint, rust and mill scale on a base metal, an angle grinder may be a quicker option. Angle grinders with sanding discs can also perform much in the same way sand paper does for gritty metals but usually much faster. Grinding discs would most likely be used for such tasks. SMAW can be a messy process that leaves a lot of slag leftover, but an angle grinder is an effective way of removing it. The angle grinder also grinds down weld beads when performing root and fill passes in pipe welding. Flap discs can also be used to smooth or polish metal before powder coating or painting it. What Are Some Best Practices for Working With Angle Grinders? 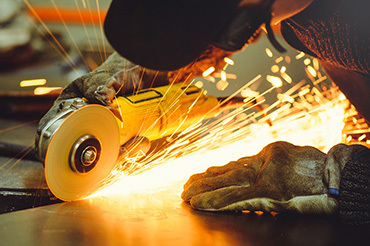 Angle grinders can help ensure a welding job goes well, but things can still go wrong when using them. If you follow these practices when using the tool, you’ll have a much higher rate of success. The maximum revolutions per minute (RPM) a grinding disc can go is usually listed on its blotter paper. Check the RPM of the grinding tool before placing a disc on it. If the machine has a higher RPM and the disc turns too quickly, it might explode. Test grinding discs for cracks before placing them on the tool. Envision that an “X” is drawn over the disc, and tap each side where each arm of the letter would be. A sharp ring is a sign that the disc is in good working condition, but a dull sound suggests the stone could be cracked and shouldn’t be used. Keeping a grinding disc trued and balanced ensures the disc stays flat on its face and sharp, which is necessary to produce the best results. Use a redressing tool to balance the disc once it’s been placed on the tool. Different grinding discs are applied ferrous and nonferrous metals. Using a nonferrous disc on a ferrous metal will prematurely wear it down. Grinding a nonferrous metal with a ferrous disc can clog the disc with the metal, having the effect of glazing it. Frictional heat created during the grinding process can result in the glazed disc exploding. When grinding discs wear down to the size of a paper blotter, they shouldn’t be used. Aren’t welding gloves important? Yes, but in the case of angle grinders, they can be a liability. Gloves can get caught in grinding discs, bringing the whole hand along with them. The point is, never wear gloves when using an angle grinder. Sparks might be awesome to look at, but they’re a lot less awesome when they’re flying in the direction of your eyes. Sparks should always be directed downward and away from people and equipment. Angle grinders are great: They remove rust, smooth welds, grind grooves and cut metal. Understanding the variety of types and sizes of discs, the range of amperages and the proper procedures when using them make them all the better. Always know your tools to be the best welder you can be. Learn more about safe practices for welders to be a better welder. Get the latest news on the Welding and HVAC/R industry! Subscribe to our blog below. We are looking for the best high school senior AG students in the country. Show off your skills for scholarships and prizes! Get the latest updates on the The Welding School, as well as, the latest news in the Welding and HVAC/R industry! Subscribe to our blog via the form to the right. Accredited School, ACCSC. TWS-Jacksonville located at 1750 Southside Blvd., Jacksonville, FL 32216 is recognized by ACCSC as a satellite location of TWS-Jacksonville located at 3500 Southside Blvd., Jacksonville, FL 32216. Tulsa Welding School & Technology Center (TWSTC) in Houston and TWS-Jacksonville are branch campuses of Tulsa Welding School, located at 2545 E. 11th St., Tulsa, OK 74104. Tulsa, OK campus is licensed by OBPVS and ASBPCE. Jacksonville, FL campus is licensed by the Florida Commission for Independent Education, License No. 2331. TWSTC and TWS in Tulsa, OK are approved by TWC. TWS in Jacksonville is licensed by the Mississippi Commission on Proprietary School and College Registration, License No. C-668. Licensure indicates only that minimum standards have been met; it is not an endorsement or guarantee of quality. Licensure is not equivalent to or synonymous with accreditation by an accrediting agency recognized by the U.S. Department of Education. TWS in Jacksonville is also regulated by the Indiana Department of Workforce Development, Office for Career and Technical Schools, 10 N. Senate Ave, Suite SE 308, Indianapolis, IN 46204; OCTS@dwd.in.gov; 317-234-8338 or 317-232-1732; http://www.in.gov/dwd/2731.htm. GI Bill® Eligible (check with local campus for specific eligibility). The AOSWT program is an Associate of Occupational Studies degree program and is not an academic degree. The AOSWT program is not approved for the following states: CO, GA, LA, MN, and TX. For more information about our graduation rates, the median debt of students who complete our programs, and other important information, please visit our website at: https://www.weldingschool.com/student-resources/regulatory-information/. Tulsa Welding School is authorized for operation as a postsecondary educational institution by the Tennessee Higher Education Commission. In Order to view detailed job placement and graduation information on the programs offered by Tulsa Welding School, please visit https://www.tn.gov/thec/bureaus/student-aid-and-compliance/postsecondary-state-authorization/authorized-institutions-and-data.html. For students who started and completed their training during the 12-month period for which 150% of normal time for completion has elapsed and who attained employment in their field of study as outlined on our annual ACCSC accreditation report dated July, 1, 2106. Total number of graduates employed in the field for all TWS campuses (1304), divided by total number of eligible graduates (1641), equals 79%. Scholarships available to those who qualify. Candidates need to refer to the scholarship information page to determine topic of essay (where applicable) and must meet all regular admissions requirements and be scheduled to start training prior to applying for a scholarship. If a student changes his/her re-enter date, the scholarship award may be forfeited. Scholarships are not transferable and most scholarships cannot be used in conjunction with any other scholarship TWS offers. In most cases, only one award will be given per student. If a student is eligible for multiple scholarships, the scholarship that is most beneficial to the student will be awarded. Scholarships will be distributed incrementally over the 2nd half of the program. Scholarship eligibility requires continuous enrollment. Failure to maintain Satisfactory Academic Progress may result in the probation and possible loss of scholarship. Termination from training may also result in the loss of a scholarship, which may increase your tuition obligation to TWS. Tuition charges will be based on the amount reflected on your Enrollment Agreement. See the reverse side of your Enrollment Agreement or the School Catalog for the school’s refund policy. *According to 2015 IPEDS data TWS has the largest total combined enrollment of students for all post-secondary schools in the U.S. with the designated largest program of CIP Code Welding Technology/Welder. 1 Total number of estimated graduates for TWS calculated based on historic data available as of 1/20/16. 2 Tulsa area annual mean wage is $45,980, Jacksonville area annual mean wage is $37,630 and Houston area annual mean wage is $51,690 for welders, cutters, solderers and brazers (514121) reported by BLS as of May 2017 http://data.bls.gov/oes. Average starting salary for Professional Welder is $32,943 for TWS Tulsa, $32,890 for Jacksonville, and TWSTC is $34,554 for graduates employed during the 12 month period of 7/1/16-6/30/17. 4 $0 registration fee & $0 in-school payments for students starting by December 31, 2018. Payment arrangements will be required for balances due prior to starting school. Offer applies to students receiving financial aid. Students making cash only payments are not eligible. 5 Scholarships available to those who qualify. Candidates need to refer to the scholarship information page to determine topic of essay (where applicable) and must meet all regular admissions requirements and be scheduled to start training prior to applying for a scholarship. If a student changes his/her re-enter date, the scholarship award may be forfeited. Scholarships are not transferable and most scholarships cannot be used in conjunction with any other scholarship TWS offers. In most cases, only one award will be given per student. If a student is eligible for multiple scholarships, the scholarship that is most beneficial to the student will be awarded. Scholarships will be distributed incrementally over the 2nd half of the program. Scholarship eligibility requires continuous enrollment. Failure to maintain Satisfactory Academic Progress may result in the probation and possible loss of scholarship. Termination from training may also result in the loss of a scholarship, which may increase your tuition obligation to TWS. Tuition charges will be based on the amount reflected on your Enrollment Agreement. See the reverse side of your Enrollment Agreement or the School Catalog for the school’s refund policy.